← How about we stop moralizing and end child poverty tomorrow? You can skip down to the new data and analysis — or go straight to my new working paper — if you don’t need the preamble diatribe. A family of three is not supposed to be living on the minimum wage. If you’re making minimum wage you shouldn’t be having children and trying to raise a family on it. In sum, a danger of social inequality is that dominant groups will be motivated to promote their own cultural goals, at least in part, by holding aspects of the behavior of specific marginal groups in public contempt. This is especially true when this behavior is viewed as antithetical or threatening to social control messages aimed at the youth in the dominant group. An acknowledgment that teen childbearing might have benefits for some groups undermines social control messages intended to convince dominant group youth to postpone childbearing by extolling the absolute hazards of early fertility. Moreover, to acknowledge cultural variability in the costs and consequences of early childbearing requires public admission of structural inequality and the benefits members of dominant groups derive from socially excluding others. One cannot explain why the benefits of early childbearing may outweigh the costs for many African Americans without noting that African American youth do not enjoy the same access to advanced education or career security enjoyed by most Americans; that their parents are compelled to be more focused on imperatives of survival and subsistence than on encouraging their children to engage in extended and expensive preparation for the competitive labor market; indeed, that African Americans cannot even take their health or longevity for granted through middle age (Geronimus, 1994; Geronimus et al., 2001). And one cannot explain why these social and health inequalities exist without recognizing that structural barriers to full participation in American society impede the success of marginalized groups (Dressler, 1995; Geronimus, 2000; James, 1994). To acknowledge these circumstances would be to contradict the broader societal ethic that denies the existence of social inequality and is conflicted about cultural diversity. And it would undermine the ability the dominant group currently enjoys to interpret their privilege as earned, the just reward for their exercise of personal responsibility. But the failure to acknowledge these circumstances results in a disastrous misunderstanding. As a society, we have become caught in an endless loop that rationalizes, perhaps guarantees, the continued marginalization of urban African Americans. In the case at hand, by misunderstanding the motivation, context, and outcomes of early childbearing among African Americans, and by implementing social welfare and public health policies that follow from this misunderstanding, the dominant European American culture reinforces material hardship for and stigmatization of African Americans. Faced with these hardships, early fertility timing will continue to be adaptive practice for African Americans. And, reliably, these fertility and related family “behaviors” will again be unfairly derided as antisocial. And so on. Whoever said demography isn’t theoretical and political? 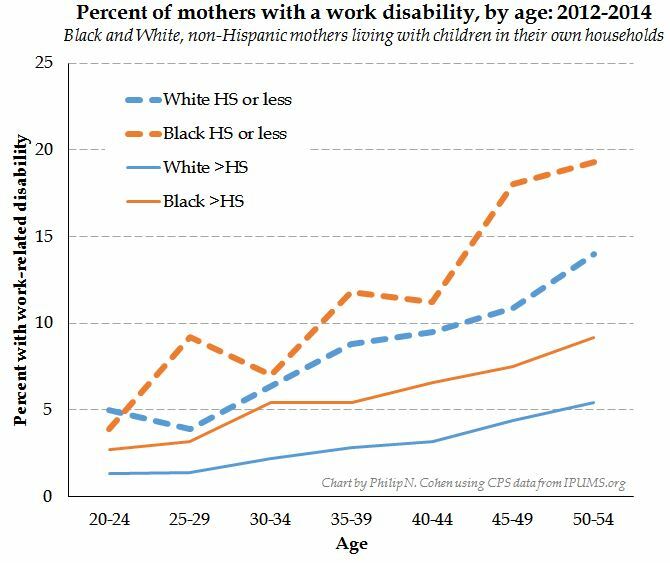 Not too many disabilities at age 20, but race and class kick in hard over these parenting years, till by their 50s one-in-five Black mothers with high school education or less has a disability, compared with one-in-twenty White mothers who’ve gone on to more education. That looming health trajectory is enough — Geronimus reasonably argues — to affect women’s decisions on whether or not to have a child (or go through with an accidental pregnancy). But for the group (say, Whites who aren’t that poor) who have a reasonable chance of getting higher education, and making it through their intensive parenting years disability-free, the economic consequence of an early birth weighs much more heavily. As I was thinking about all this the other day, I went to check on the latest infant mortality statistics, since that’s where Geronimus started this thread — with the observation that White women’s chance of a baby dying decline with age, while Black women’s don’t. And I noticed there is a new Period Linked Birth-Infant Death Data File for 2013. This is a giant database of all the births — with information from their birth certificates — linked to all the infant deaths from the same year. These records have been used for analyzing infant mortality dozens of times, including in pursuit of the weathering hypothesis, but I didn’t see any new analyses of the 2013 files, except the basic report the National Center for Health Statistics put out. The outcome is now a working paper at the Maryland Population Research Center. The gist of the result is, to me, kind of shocking. Once you control for some basic health, birth, and socioeconomic conditions (plurality, parity, prenatal care, education, health insurance type, and smoking during pregnancy), the risk of infant mortality for Black mothers increases linearly with age: the longer they wait, the greater the risk. For White women the risk follows the familiar (and culturally lionized) U-shape, with the lowest risk in the early 30s. Mexican women (the largest Hispanic group I could include) are somewhere in between, with a sharp rise in risk at older ages, but no real advantage to waiting from 18 to 30. 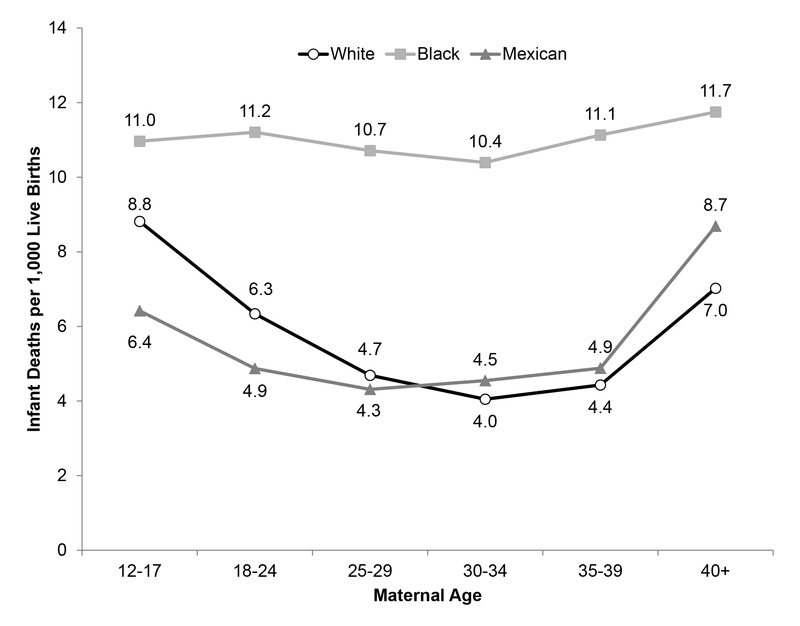 Infant Death Rates, by Maternal Age: White, Black, and Mexican Mothers, U.S., 2013. Infant death rates per 1,000 live births for non-Hispanic white (N = 1,925,847), non-Hispanic black (N = 533,341), and Mexican origin (N = 501,390) mothers. Data source: 2013 Period Linked Birth/Infant Death Public Use File, Centers for Disease Control. 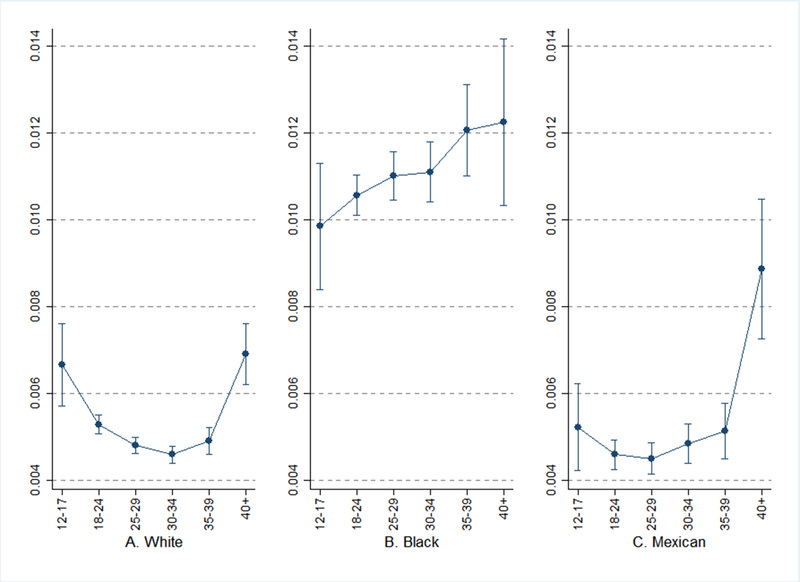 Adjusted Probability of Infant Death, by Maternal Age: White, Black, and Mexican Mothers, U.S., 2013. Predicted probabilities of infant death generated by Stata margins command, adjusted for plurality, birth order, maternal education, prenatal care, payment source, and cigarette smoking during pregnancy; models estimated separately for white (A), black (B), and Mexican (C) mothers (see Tab. 1). Error bars are 95% confidence intervals. (A separate test showed the linear trend for Black women is statistically significant.) Data source: 2013 Period Linked Birth/Infant Death Public Use File, Centers for Disease Control. My jaw kind of dropped. Infant mortality is mostly a measure of mothers’ health. Early childbearing looks a lot crazier for White women than for Black and Mexican women, and you can see why the messaging around delaying till your “ready” seems so out of tune to the less privileged (and that really means race more than class, in this case). Why wait? If women knew they had higher education, a good job, and decent health care awaiting them throughout their childbearing years, I think the decision tree would look a lot different. Of course, I have often said that delayed marriage is good for women. And delayed childbearing would be — should be — too, as long as it doesn’t put the health of the mother and her children at risk (and squander the healthy rearing years of their grandparents). Please check out the working paper for more background and references, and details about my analysis. Americans have been delaying marriage for at least the 160 years that I’ve been researching. It’s only — white, of course — Appalachians who got consistently got married had children early. For everyone else, the typical first marriage age was 22-25, and for men 25-27. Occupations, if it helps, were farmers, pharmacists, laborers, etc. EDIT: naturally, I haven’t been researching for 160 years. It’s the 160 year range which I have data for. Does your adjusted rate vary from 0.011 to 0.012 from 18 to 40? (obviously childbirth at 12-17 is acceptable to no society) Is this a variation that is statistically significant and worth making decisions on? My point is everybody is, even for those who are in agreement with you (delaying child birth beyond a certain age confers no benefits to mother or child) will find it hard to agree with your results. It just is not there. Remember the statistics that you claimed to show that recession caused divorces or delayed marriage. This does not mean that we agree with people who say poor people don’t have kids. The full results with significance tests are in the paper. Here’s the problem with your analysis. I’m sure the statistical risk calculations are right, but they assume that the situation for young black women is as it is and unchangeable. You need to get to know young black women with babies to see that regardless of the data, it’s no picnic. Wouldn’t it be better to argue that IN ADDITION to advocating a delay in childbearing for black women, we need to promote policies to change their economic and educational circumstances? Phil Cowan raises an important point about the importance of poilcies to improve the economic circumstances and educational opportunities (as well as stress-inducing discrimination and fear) among black women. I agree that it would be ideal if black women, on average, could benefit from the advantages that delayed childbirth provide to other women. The problem is that these policies do not currently exist nor is there any real hope that black women’s situations are going to improve in the near future. In the climate that actually exists today, therefore, asking a black woman today to delay childbirth is equivalent to suggesting that she should put her own health and that of her children at risk (with consequences that likely extend throughout the child’s entire life course). Certainly doing so is irresponsible and, I would argue, morally indefensible. But Spence and Eberstein results do support Cohen’s conclusions! Sorry, you seem to have corrected at 11.27, I did not notice. Black women have been having fewer babies, and at older ages, since the spike year of 1991. Do you support their choices?